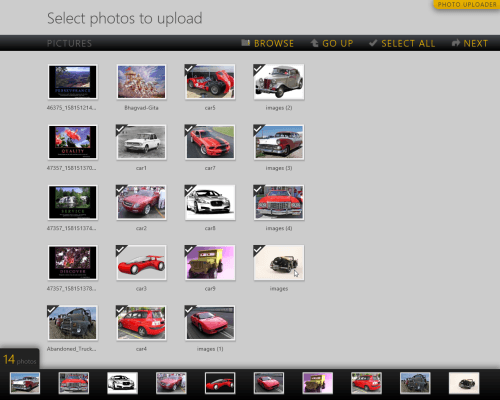 Photo Uploader for Facebook Windows 8 app lets you perform mass uploading of images to your Facebook account. This might appear nice in the beginning , but one must not forget that even the browser-based interface of Facebook delivers you the option to upload multiple images in a go. So the question arises, “Why to use Photo Uploader for Facebook Windows 8 App?”. Well, it not only lets you upload multiple images, but also allows you to apply several effects to your images before uploading. On launching Photo Uploader for Facebook app for Windows 8 for the first time you will be presented the list of images fetched form Pictures Library. Have a look on the screenshot placed below. If the images are on some different directory then you can utilize the ‘Browse’ button placed on the bar at top right region of app window. Adjacent to it is another navigational control to ‘Go UP’ on level up in the hierarchy without having to utilize the browse button. Once, you have navigated to correct destination, then you will require selecting the images to be uploaded. Click on the thumbnail of particular image after which it will attain a check sign and will appear in the horizontal bar at bottom. After, selection you will need to click on ‘Next’ button placed on the rightmost corner of the control bar at top. 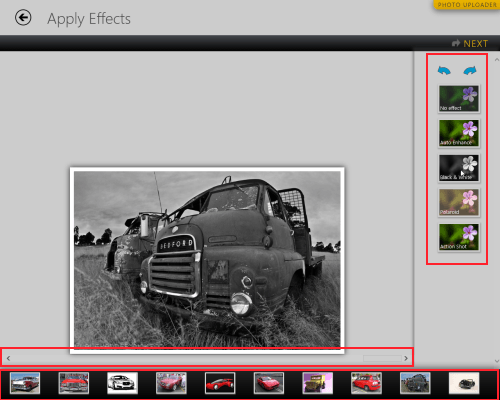 Soon you will be redirected to a new interface for applying effects to your images. All you need is to select the image from the horizontal bar and apply effect by clicking on the list to the right. Then, click on the ‘NEXT’ button on the top. Soon, you will be prompted to login and then to authorize Photo Uploader for Facebook Windows 8 App to access your data and to post on your behalf. After successful login and granting requested permissions you will be taken to a similar window as in screenshot below. Finally you need to specify name for album, a short description for it, and then click on ‘Start Upload Now’ button. 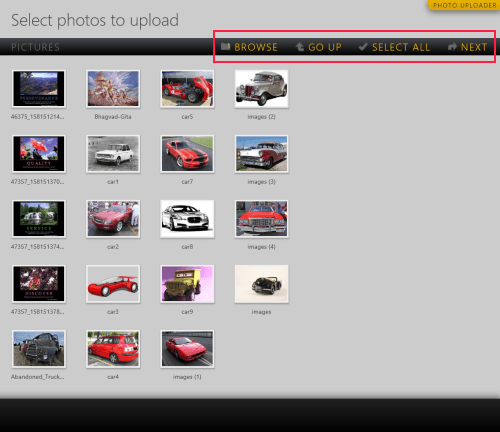 After successful transfer, you can login to your Facebook account and locate the newly uploaded folder under ‘Photos’. Also, check out our posts on Facebook Client Apps, Instagram Client Apps, and Facebook Album Exporter. You will require opening this link in Internet Explorer 10 or later. In the Windows Store, click on Install button. 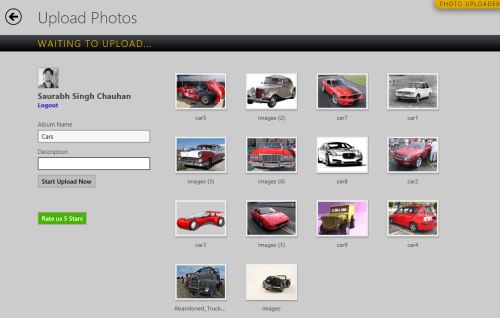 Photo Uploader for Facebook Windows 8 App is 100% free and very stable. I have no issues in recommending it.